We here at Arizona Pool Dogs have only one thing in mind for your dog, Pool Safety! Hundreds of dogs drown year around in many, many, pools all over Arizona. Too many of our beloved dogs are simply not taught what to do if they were to ever unfortunately fall into the family pool. When dogs fall into a pool they experience several things. If they do not know how to swim they panic, hook onto the side of the pool, or they panic stroke or do not have enough of a stroke and never find their way out. Their are no actual know statistics of how many of our beloved pets are lost due to drowning each year. No one wants to keep track. We have talked to several pool cleaning associates and many of them each know of at least a handful of their client's dogs that have ended up at the bottom of their pool each summer. Think about it, if every pool cleaning associate knows of at least 5 dogs that they are aware of that have drowned in one summer, how many pool cleaning associates are in Arizona? A LOT! Drowning is an awful way to loose your pet and do not think because your dog stays away from your pool they will be safe. Many dogs have fallen in their pools and have drowned because of high storm winds throwing them off balance or simply by just looking up and chasing a bird flying by. Please do not wait until it is too late for your dog. Loosing your dog by drowning is an awful thing to have to experience and even more awful for your dog to go through. Please be responsible and make sure your dog is safe around your pool either by putting up an iron fence around your pool, by always supervising your dog around the pool, or by simply getting them trained to be pool savvy. We at Arizona PooL Dogs want your dog to have the safest life possible and if you have a pool then please, please, please train and teach your dog POOL SAFETY and to have fun and enjoy your pool! Hi! My name is Lisa and I am The Canine Pool Trainer Specialist and the Owner of Arizona Pool Dogs. I am a certified professional dog trainer and I have received my credentials through Animal Behavior College, of which I am a mentor for the college as well. I have furthered my dog training education through ABC and I also have a certification in Training Shelter Dogs. I am Canine CPR and First Aid certified through the Red Cross and I am also a Certified Reiki Master. 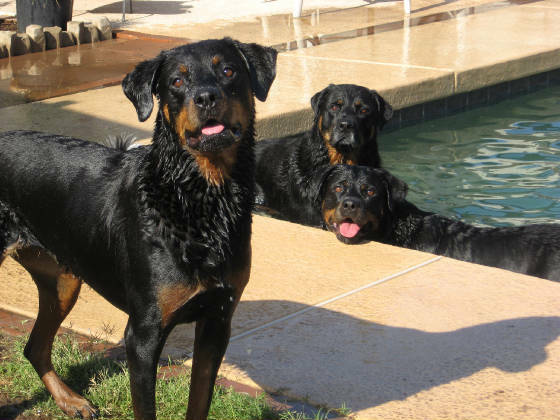 I LOVE the water and I started training my 3 Rottweilers over a decade ago in my pool to swim, be safe, retrieve, and to just love the water. Today, swimming keeps all my dogs in shape along with providing them with an energy outlet. I have sinced trained my visually impaired Pug, and my small dogs to swim as well. I LOVE training dogs and I absolutely LOVE training dogs in the water! I truly enjoy witnessing a dogs progress in the water and also their genuine love of the water. I am a Canine Behavior Specialist and I provide In-Home Obedience and Behavioral Training as well. I not only train dogs in the water, but also on land! I train dogs to be therapy dogs for Pet Partners as well. My true gift and what I enjoy the most is training dogs in their pools! I believe I am one of the few residents here in Arizona that live for our summer months because I get to spend many endless hours a day in many pools training many dogs to be pool savvy and to enjoy the water! Hi, my name is Caitlynn and I have worked with Arizona Pool Dogs for a few years and I absolutely love it! I am a Canine Obedience & Pool Training Specialist. I have always had a love for all animals, however my heart and passion has always been working with dogs. Through volunteer work I developed the patience it takes to train dogs and enjoy every minute of it. Most recently, I volunteered at Arizona Animal Welfare League. Together, we taught puppies, group classes, and soon to be adopted dogs their manners. I received my credentials through Animal Behavior College and have enjoyed training dogs since then. In addition to that, I also received a Certification for Animal CPR and First Aid through PetTech. This training and learning has been a great experience for me. I take pride in my passion for training and love seeing the transformation between dogs and their respective owners. "Maldonado is a passionate dog lover with a gift for teaching dogs how to swim and be safe around water." "She's done something unique and special based on where she is, and theres's not a whole lot that focus on that specifically like she does." "She trains dogs using gentle, positive reinforcement in your own pool to condition canines to have safe fun in the water." "While some may scoff at the idea of specialty swimming lessons for pets, it's a valuable skill that can mean the difference between life and death. We would add, even if you have a fence, it's wise to invest in pool safety." "Thank you Lisa for making Quincy pool safe! We are so grateful to you for teaching our almost nine year old dog to overcome his terror of water and how to get out of the pool safely. We can’t believe you were able to accomplish this in two sessions." "Thank you so much for giving Zephyr the gift of swimming! His is doing laps and really seems to love the fact he has a place to cool down now! Thank you for everything you did!" "Making sure that our dogs were safe around the pool was my number one priority in working with Lisa, and the training she did with our one-year old Boxers has given me peace of mind, and so much more. 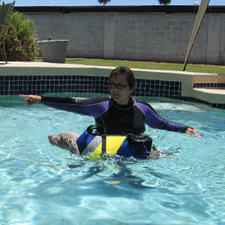 Prior to working with Lisa, Scout would panic in the water and cling to the side of the pool. Now, she is able to locate and calmly swim to the steps every time she is in the water. Rowdy is leaping into the water, chasing after toys and absolutely loving the pool. We just finished our fourth session, and its already been a great source of exercise for both dogs. Lisa is such a talented trainer. She’s patient, kind, and very professional. I learned so much just by watching her work, and would very highly reccommend her to anyone! It is so reassuring to know that we’ve done everything we can to keep our dogs safe. Thank you Lisa!" "Lisa was AMAZING with my 2 Dobermans! My 7 year old Doberman had been uncomfortable in the pool for 6 years. Our recent rescue was terrified and fell in and hung onto the side. I was so afraid that would happen when we were not home. At the end of the 4 lessons my male was more comfortable in the water and was swimming without the life jacket. My female was jumping in to retrieve a water toy and seems to love the game!" "Lisa is just awesome! Who would have thought that a Schnoodle and a Lhasa Apso could be coaxed into the pool! We love her!" "My dog Stella just had her final swimming lesson with Lisa. Wow, what a great time we had! Stella would not even attempt to get in the water and in fact was afraid to get too near. Now after four lessons she is jumping in and swimming! I am so very pleased. Lisa is a professional in every way. She is calm, capable, and had a love for what she is doing. Thank you Lisa!" 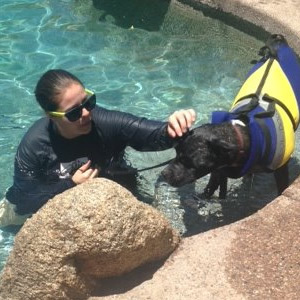 Arizona Pool Dogs does not guarantee that your dog will never drown after they have received our pool training. It is the responsibility of the owner to keep up the water training in order for their dog to have a lesser to no chance of drowning.